The present work seeks to focus attention on the richness and variety of the Atharvanic literature. It undertakes to give at one place a comprehensive and connected account of the profuse ancillary literature belonging to the Atharva-veda. This book also aims at bringing to the foreground the vast and important but mostly neglected literature in the Vedic field, namely, the Atharva-Veda Parisistas. The Atharva Veda Parisistas deal with a number of subjects like the lore of constellations, royal ceremonies, rituals, religious observances, magic, philology, omens and portents, etc. The present study is divided into two parts. 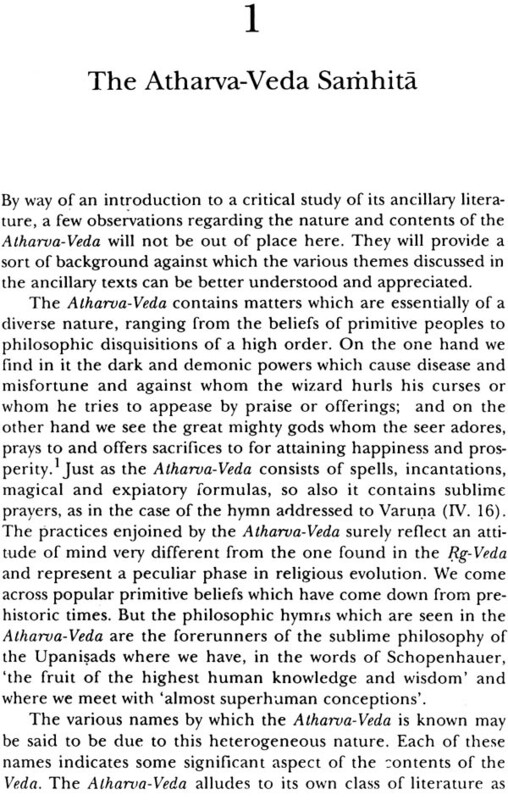 The first part describes in brief the nature and contents of the Atharca-Veds sanhita nad then takes up the ancillary texts, other than the Parisistas. The second part deals exclusive and exhaustively with the Atharva-Veda Parisistas. All the Parisistas have been studied in detail and their contents have been critically and systematically restated. Some general questions such as those relating to the date, the style, etc. of the parasites have also been discussed. The study concludes with an index of the Atharva –Veda Brahmana, the Kausika Sutra, the Vaitana sutra, the Parisistas and other Vedic texts. Dr B. R. Modak (b. 1928) received his Ph. D. Degree from the University of Poona. He was Professor of Sanskrit at the Karnataka University. Dr. Modak delivered lectures in a number of universities both in India and the USA. He was hounoured by the Government of Karnataka for his valuable contribution to Sanskrit literature. 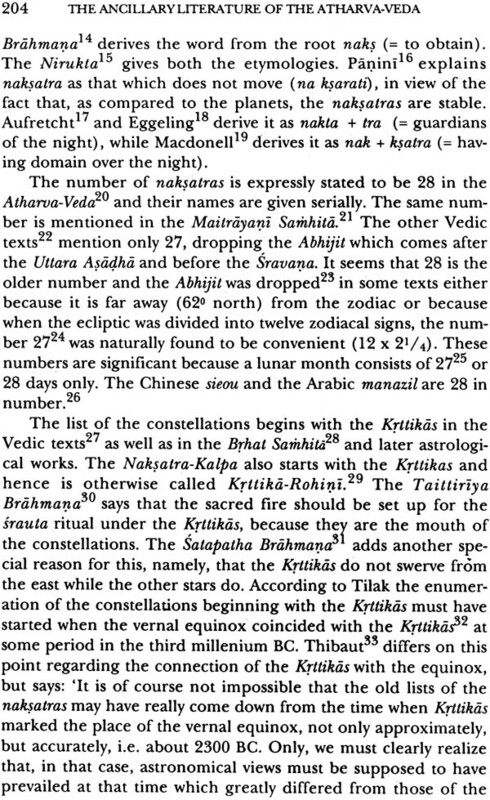 Professor Modak has edited Svarajya-Siddhi, a manual of Advaita Vedantaa. He has completed the project ‘Contribution of Karnataka to Sanskrit’ sponsored by the University Grants Commission, New Delhi. The Atharva –Veda is a book of ancient wisdom which deals with a number of subjects which have supra-terrestrial and terrestrial significance. A good deal of occult knowledge of the ancients is stored in this Veda. The exact meaning of the Veda has been a matter of research of the last several millennia; hence it is not possible to say with great precision what significance was can attach to the occult knowledge contained in the Atharva-Veda. In this context, the appendices of the Atharva-Veda promise to throw useful light. Rashriya Veda Vidya Pratishthan is happy that Dr B. R. Modak undertook the task of bringing large number o f appendices together and of writing a thesis and recommends its publication under the scheme of the Pratishthan. We feel that this publication will enrich our knowledge about the Atharva-Veda and will stimulate Vedic scholars to undertake further research in various issues which are relevant to the Atharva-Veda and its appendices. It has been observed-and, indeed very rightly- that the Rg-Veda and the Atharva-Veda together present a more or less full picture of the life of Vedic man in all its aspects. Broadly speaking, the Rg-Veda, which may justifiably be called ‘the Veda of classes’, deals with the higher strata of society consisting of poets, priests and princes, while the Atharva-Veda is pre-eminently ‘the Veda of the masses’. In other words, it may be said that the Rg-Veda represents the main hierarchical current of Vedic culture and the Athrava-Veda represents it popular undercurrents. The two Vedas are thus complementary to each other. In a sense, however, the Atharva-Veda must be said to possess far greater interest from the socio-historical and cultural points of view than the Rg-Veda , for , by its very nature he Rg-Veda has a restricted choice of subject matter. 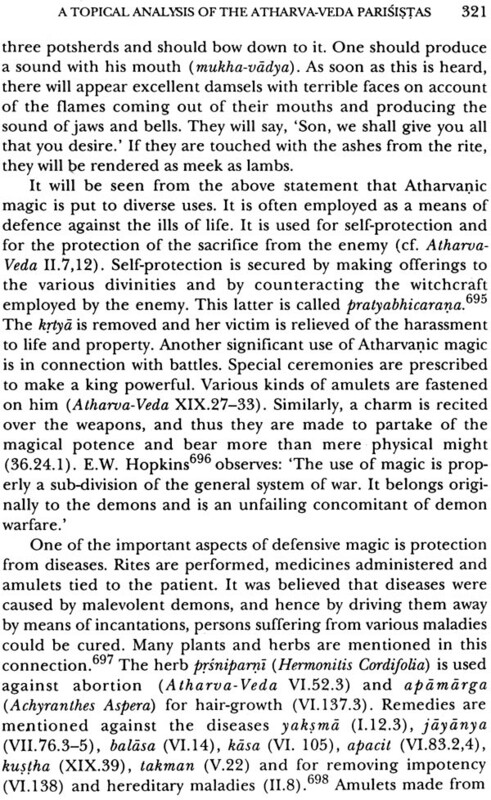 The hymns in the Rg.Veda relate to what may be called hierarchical mythology and sacrificial ritual, especially the soma offering, but we get to know very little from it about the popular way of life and thought-about magic, medicine, witchcraft, spirits, etc. These matters do not fall within the purview of the sophisticated thinkers of the Rg-Veda. The Rg-Veda can by no means be said t touch all spheres of life, private as well as public. 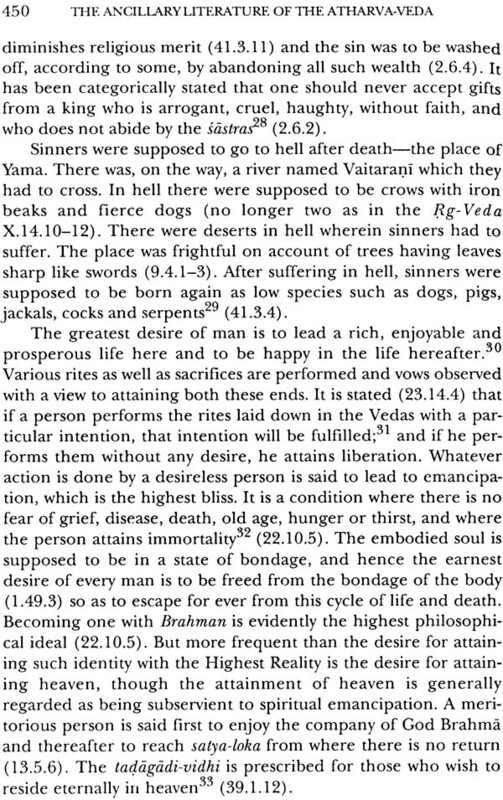 The Atharva-Veda, on the other hand, exhibits remarkable freedom in the choice and treatment of its subjects. It portrays the life of the common man, in all its light and shade, hopes and fears, in its vicissitudes from the womb to the tomb- indeed, from the pre-natal to the post-mortem condition. With its essentially heterogeneous material, embodying ‘hymns and stanzas for the cure of diseases; prayer for health and long life; charms for the prosperity of home and children, cattle and fields; expiatory formulas designed to free from sin and guilt; charms to produce harmony in the life of families and in the deliberations of the village assembly; charms concerned with love and marriage and, indirectly, with the rivalries and jealousies of men and women in love; conjuration against demons, sorcerers and enemies; charms for king sin pace and war; and charms calculated to promote the interests of the Brahmanas’, the Atharva-Veda is a veritable mine of information regarding the full life of t common man. In this Veda’ the obscurer relations and emotions of human life are brought to the surface and exploited. 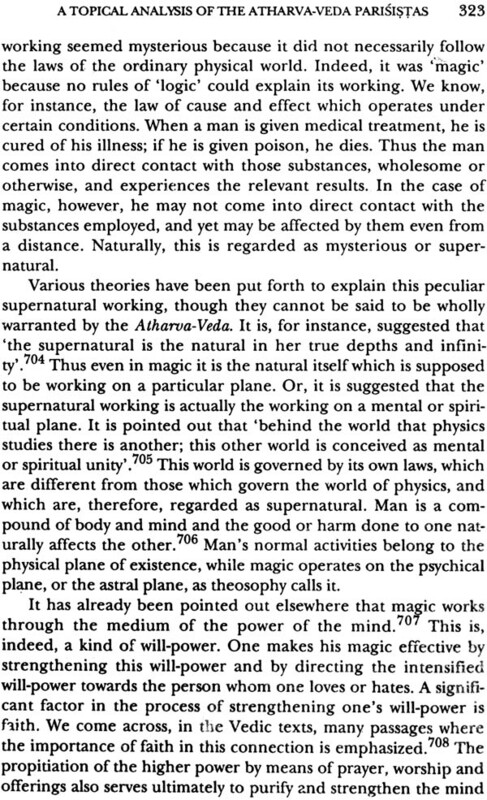 ‘ On the popular plane of religion, the Atharva –Veda certainly deal with notions of greater antiquity than those of Rg-Veda , though it is generally believed hat on the higher philosophical place the Atharva-Veda represents a more advanced stage. Therefore, the Atharva-Veda, accordingly, possesses great value not only as a source of the source of the culture history of ancient India, but also as a highly interesting anthropological document. 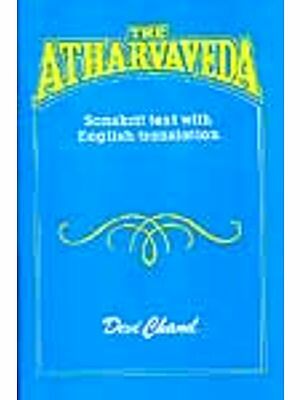 The Atharva-Veda is a Veda of practical performance par excellence. It is easily seen that a majority of its mantras are intended to serve a definite and ‘drastically practical’ purpose. Even the so-called physic hymns in this Veda aim at some practical end. The viniyoga (application) aspect is, therefore, more important in the Atharva –Veda than in any other Veda. 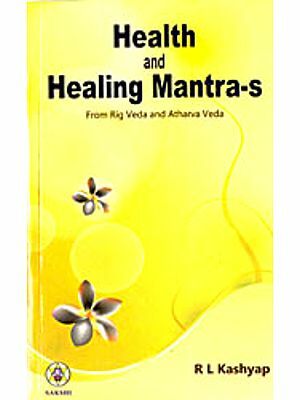 An adequate understanding of this Veda , therefore, depends to a large extent upon the knowledge of the rites and practices which its mantra s are prescribed to accompany .Very often however, there is hardly any rational connection between the contents of a mantra and its viniyoga. The employment of the hymns often appears secondary and to be without any bearing on the real nature of ht hymns. As is to be expected with the primitive way of life and thought, this connection is essentially magical rather than logical. 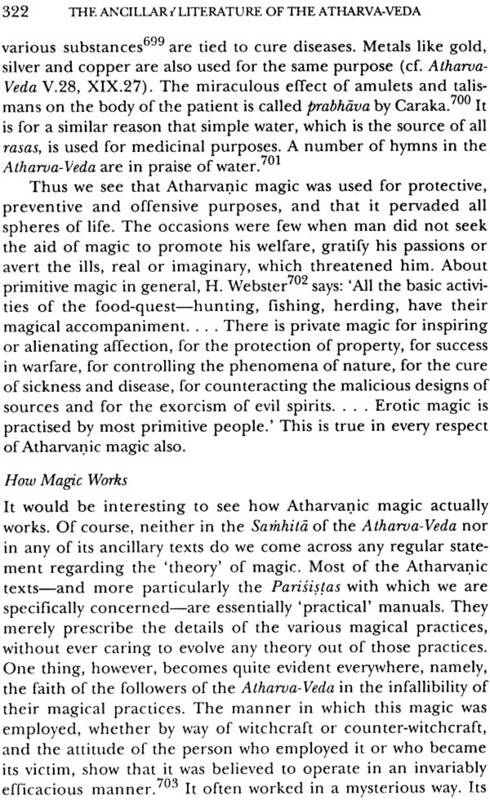 For a proper understanding of this tradition of Atharvanic magical ideology and practices one has necessarily to depend upon the ancillary literature belonging to the Atharva-Veda. For it is in that literature that the tradition is preserved more or less fully. Without a critical and comprehensive study of this ancillary literature, which, incidentally, is quite profuse, one cannot hope to be able to form an adequate estimate of the Atharva-Veda and it as peculiar thought complex. The Atharva-Veda has come down to us in two recensions-the Saunakiya and the Paippalada, though it is traditionally believed to have had nine sakas of these two recensions, the Saunakiya recensionis more popularly known. The ancillary literature belonging to the Atharva-Veda comprises, as stated by the Caranabyuha, of the following works. 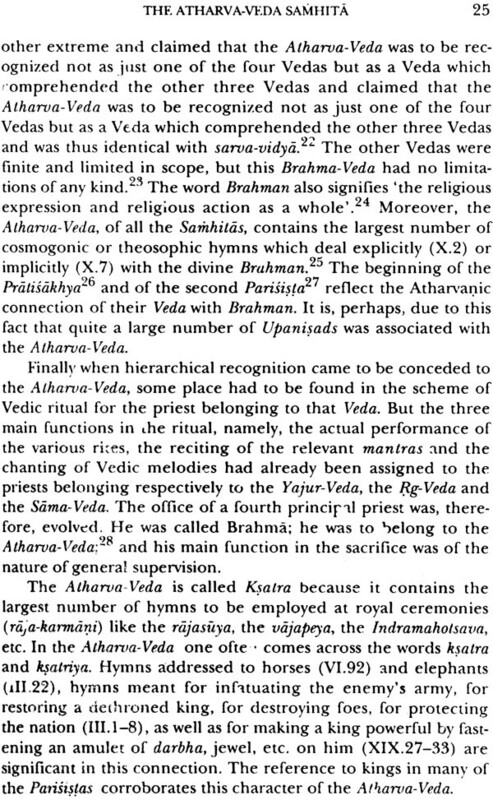 Generally speaking each Veda (or Vedic school ) has its Samhita, Brahmana, Aranuaka and Upanisad, Similarly, from among the six vedangas each Veda has its own siksa, kalpa chandas an d jyotisa-the same vyakarana and nirukta being regarded as common to all the Vedas for all practical purposes. 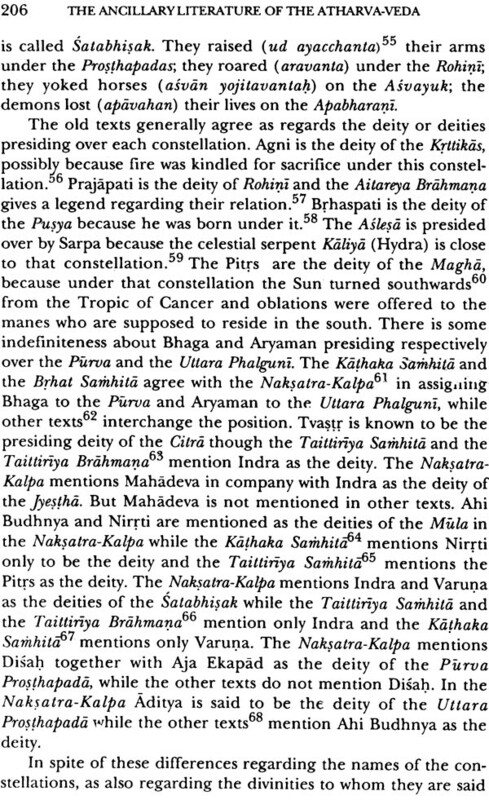 The enumeration of the ancillary texts made above will show some points about the Atharva-Veda in this respect. There is no Aranyaka belonging to the Atharva-Veda but there is a very large number of texts calling themselves Upanisads. 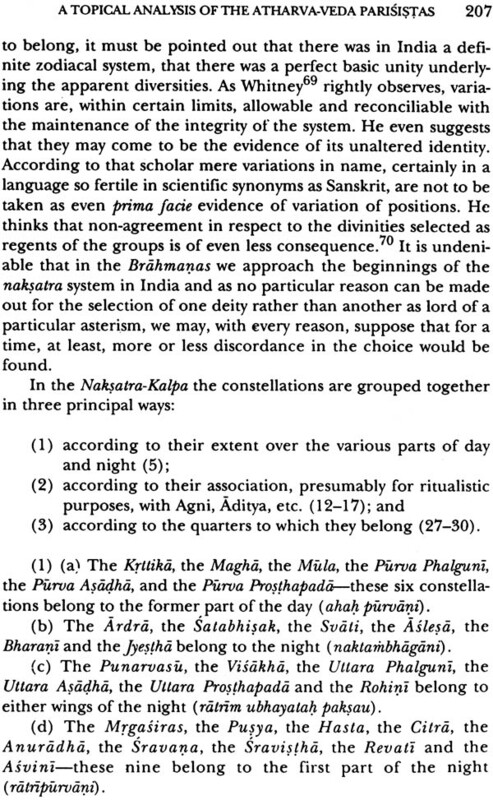 The siksa of the Atharva-Veda will be found in its Pratisakhya, Caranavyuha, as also in one of its Parisistas (varnapatala, Atharva –Veda Parisista 47) and in one of its Laksanagranthas (Danlyosthavidhi). As regards Kalpa-literature, the Athrava-Veda is well-known for its five kalpas. The Naksatra-kalpa, which is counted as the first among the Parisistas, deals with the rites to be performed under various constellations. 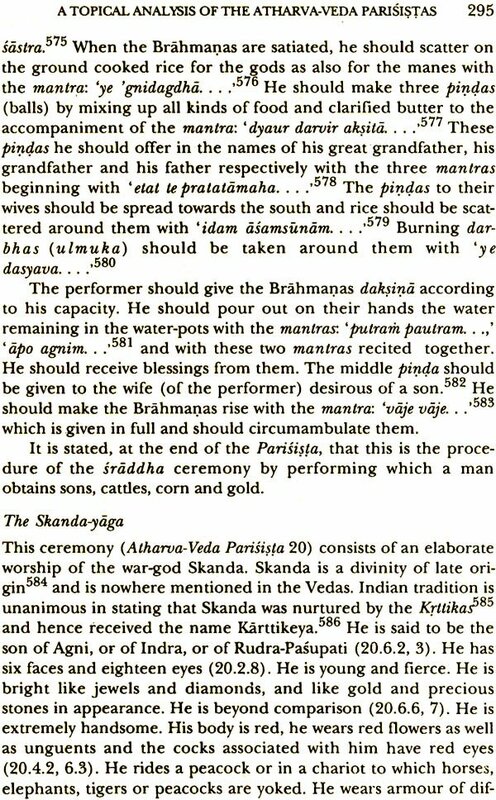 The Santi—kalpa is an important text dealing with the pacificatory ceremonies which are often encountered in Atharvanic literature. The Vailana-kalpa is the same as the vaitana sutra, which is partly a Grhya sutra. There is no extant Dharma Sutra belonging to the Atharva-Veda, although Paithinasi is mentioned as the author of a smrti and is referred to as such by Darila, the commentator of a Smrti and is referred to as such by Darila, the commentator of the Kausika Sutra, by the Atharvaniya Paddhali and is often mentioned in the Parisistas. 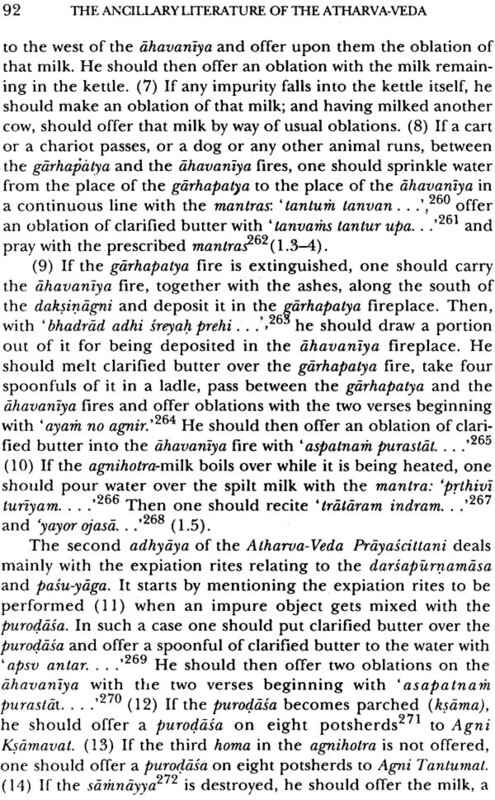 The Atharvanic vyakarana is treated in the two texts, Caturadhyayika and Atharav-Pratisakhya. 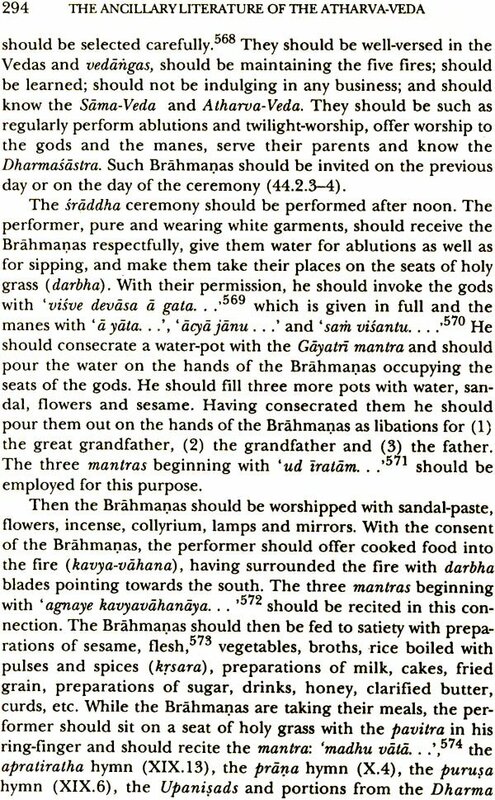 Which are included among the Laksanagrnthas. 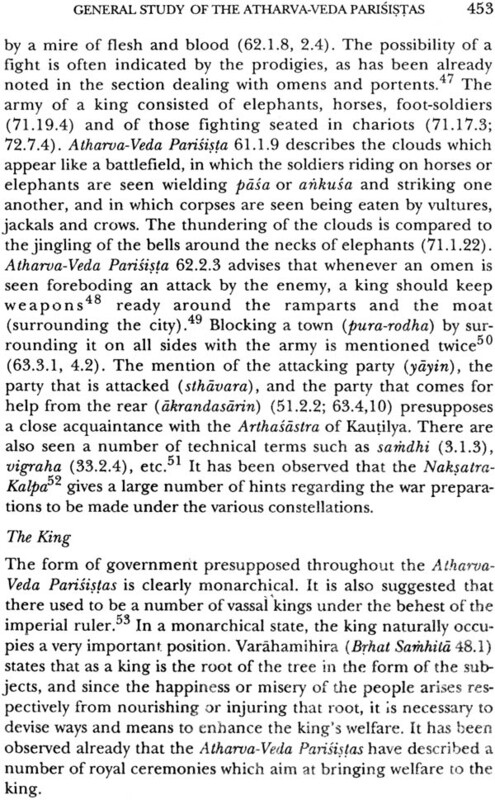 No Atharvainc text dealing with chandas has come down to us. Some indications regarding Atharva –Veda jyotisa can be traced in the Nakstara-kalpa (Atharva-Veda ) and in the Atharvana Jyotisa. 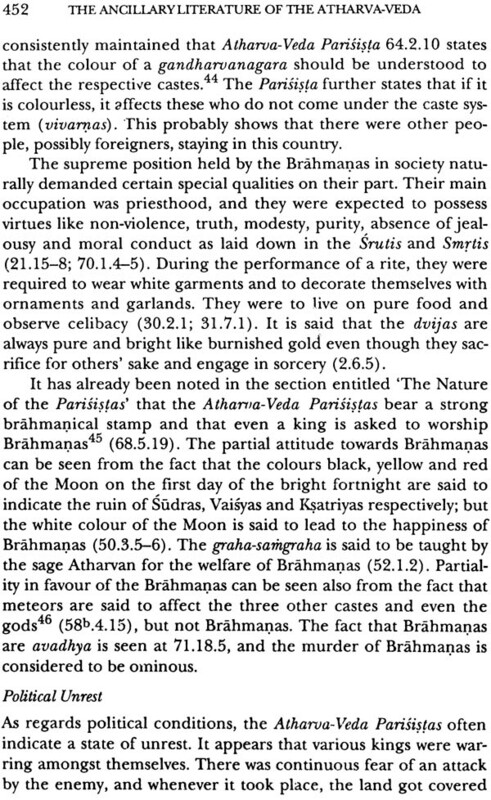 One Atharvanicnighanty is included among the Parisistas (kautsavya-nirukta-nighanty,Atharva-Veda Oarususa). Apart from their specific purpose the three texts, Dantyosthavidhi, Pancapatallika and Brhatsarvanukramnai, which are included among the Laksanagranthas, are important also from the point of view of the text-criticism of the Atharva-veda. 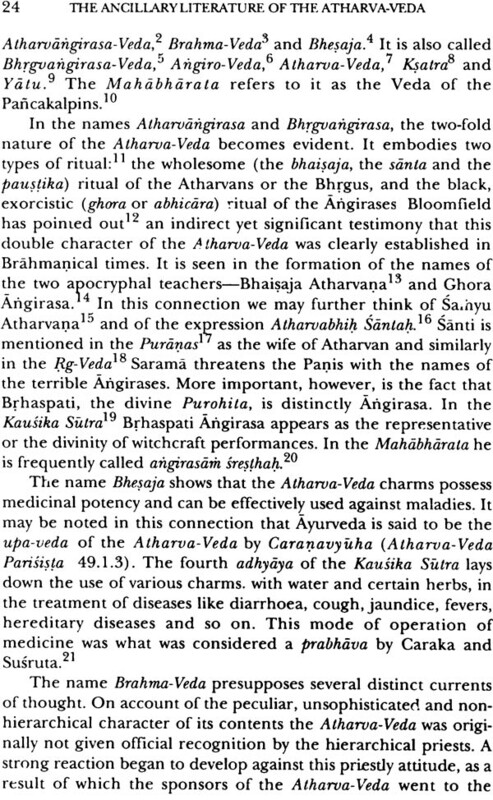 The Parasites of the Atharva-Veda, which form a voluminous literature, throw light on the Atharvaninc traditions, beliefs and practices perhaps more fully than any other ancillary work. They may, therefore, be regarded as constituting the most significant aid for the study of the Atharva-Veda. 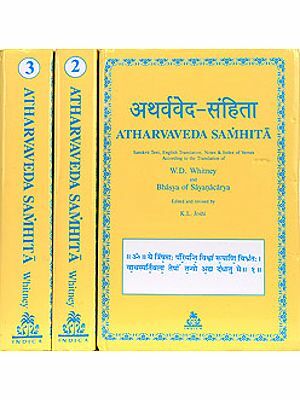 A brief survey of the more important work already done in the field of the study of the Atharva –Veda and its ancillary literature may be usefully attempted here. It is hardly necessary to emphasize that a really fruitful study of the Veda can proceed only on the basis of carefully prepared critical editions of the Samhitas and other ancillary texts pertaining to it. As early as 1856 the Atharva-Veda Samhita in the Asunkiya recension, critically edited by the veteran Vedists Roth and Whitney, was published in Berli,. It contained only the text without any commentary, as no commentary was then known to have existed. In 1880, S.P. Pandit announced the discovery of a commentary on the Atharva-Veda Samhita, which was ascribed to Sayan. Pandit worked on that commentary assiduously for fifteen years and finally brought out (1895-98) in four volumes the Sauynakiya recension of the Athava-Veda Samhita together with the pada-text and the commentary of Sayana. In the meantime Roth had discovered in 1875 the Paippalada recenison of the Atharva-Veda in a single birch-bark manuscript at the University Library of Tubingen. He called it The Atharva-Veda in Kashmir. Later, in 1901, Bloomfield and Garbe published the complete text of the Paippalada recension in three volumes in the form of chromophotographic reproductions of the Tubingen manuscript. Another edition of the Paippalada recession with the text in Roman script and a translation with critical notes in English was undertaken by L.C. Barret in 1906 and completed in 1940. In Indian, between 1936 and 1941, Raghuvira published, in three volumes, the Pippalada recension, from a single birch-bark Kashmiri codex. Several editions of the Saunakiya recension of the Atharva-Veda have been published in India . One of these was published by Sevaklal at Bombay in 1884. This was just a copy of the text edited by Roth and Whitney. Another edition with Hindi interpretation by Kshemakarandas Trivedi was published at Allahabad between 1912 and 1921. The Sunakiya Samhita with Sayana’s Commentary was published by A. Shastri at Calcutta in 1913. In 1919, Lahiri published at Howrah the text, commentary and Bengali translation of the Atharva-veda.SAtavalekar published his edition of the Saunakiya Samhita at Aundh in 1939. It does not contain the commentary. The credit of producing the first English translation of the entire Atharva-Vda belongs to R. T. H. Griffith. Published at Banaras in two volumes in 1895-96, the Griffith edition gives a free rhythmic rendering of ht Saunakiya Smhita. But it was whiney who did the Herculean task of preparing a truly critical English translation of the Saunakiya recension. This translation, ably edited by Lanman, was published posthumously in 1905. It contains a fairly comprehensive introduction and copious exegetical notes. 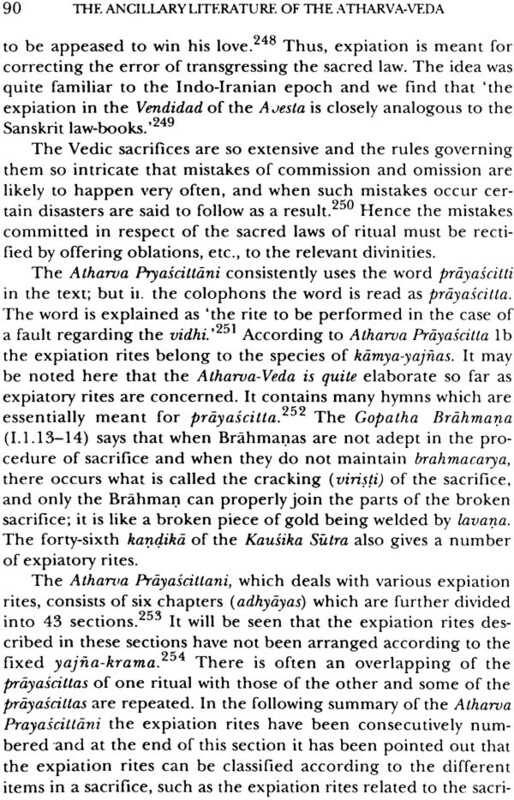 In his Indische Studien, Weber published a German translation of the first five kandas of the Atharva-Veda with an introduction, critical comments and indices. The most outstanding name in the field of Atharva-Veda scholarship may, however, be said to be that of Maurice Bloomfield. It was, indeed he by whom ‘the Atharva-Veda was Bloomfield. It was, indeed, the by whom’ the Atharva-veda was brought down from the clouds and give n a resting place on terra firma’. In 1897 Bloomfield published his Hymns of the Atharva-Veda. In this work he gives a detailed introduction dealing with various problems relating to the Atharva-Veda, and English translation of selected hymns arranged subject-wise, critical comments an indices. A German rendering inverse of selected hymns of the Atharva-Veda wasmade by Friendrich Ruckert, and a hundred selected hymns were translated into German by Julius Grill and published under the title Hundert Lieder des Atharva-Veda in 1879 at Tubingen. 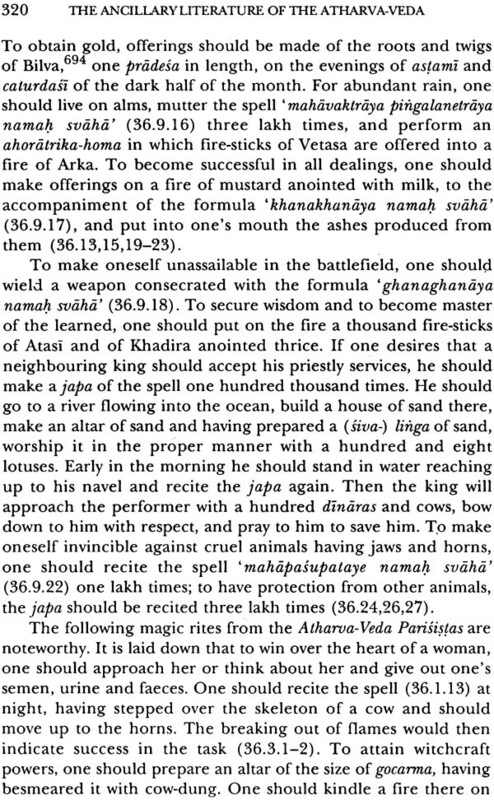 Reference may be made in this connection t he Hind translation with commentary of the first eighteen kandas by satavalekar, which was published in three volumes in 1929. Besides the woks mentioned above, many individual hymns from the Atharva-Veda have been translated and critically treated by several scholars. A complete alphabetical index of the words in the Atharva-Veda was compiled by Vihveshcaranad and Vidyanad ad was published at Bombay in 1907. Whitney also prepared and Index Verborum to the Atharva-Veda, which later formed the basis of his contributions to ht Sanskrit-German lexicon published by the Imperial Academy of Russia. A s regards the ancillary literature of the Atharva-Veda, not much critical editorial work can e said to have been done. Critical editions of the various texts coming under this head are still a desideratum. Some of these texts have not, as yet, seen the light of day, while others have been published only in periodicals, some of them in the Roman script. 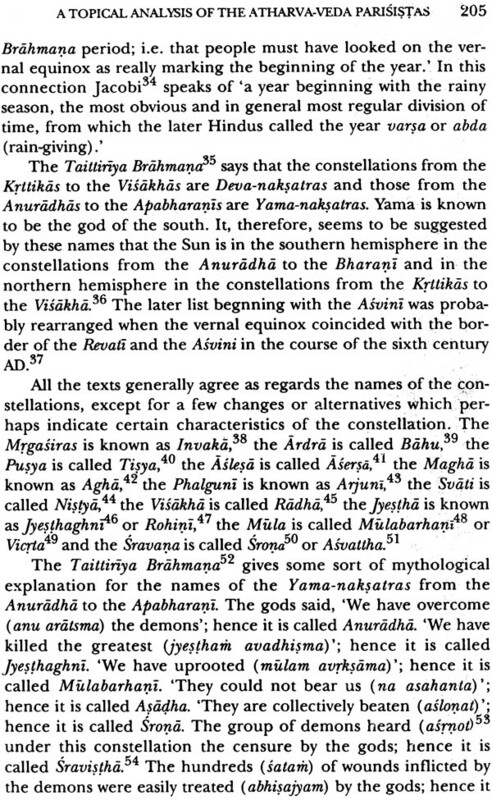 A few texts like the Angirasa-kalpa, mentioned in the Caranavyauha (Atharva-Veda Parisista ), are known only by their names. The Gopatha Brahmana was first edited by Rajendrala Mitra and Harachandra Vidyabhusan. This edition contains, besides the text of the Brahman, an introduction which deals with such questions as the place of the Atharva-Veda among the Vedas, its recensions and the Upanisads ascribed to it. It also gives the contents of the Goaptha Brahmana and a note on the manuscript. Material used by the editors. A more critical edition of the Goaptha Brahmana was prepared by Dieuke Gaastra and published at Leiden in 1919. This edition also contains a critical introduction in German regarding the manuscript, the contents of the Gopatha Brahman, its place in the Atharva –Veda literature, and its similarities with other Brahmanas, at the end of the text, Gaastra gives an index of the mantras referred to in the Gopatha Brahmana. 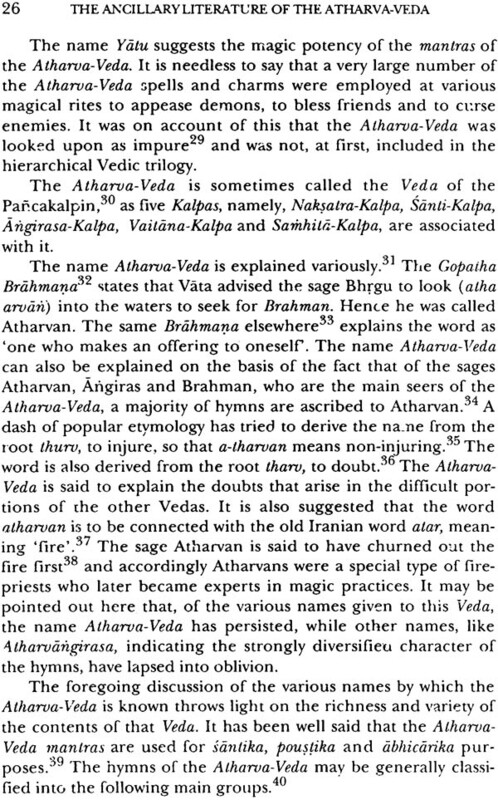 As the so-called Atharvanic Upansiads have been excluded from the survey of the ancillary literature of the Atharva –Veda in this study, details regarding the editions, etc. of these Upanisds have not been give here. 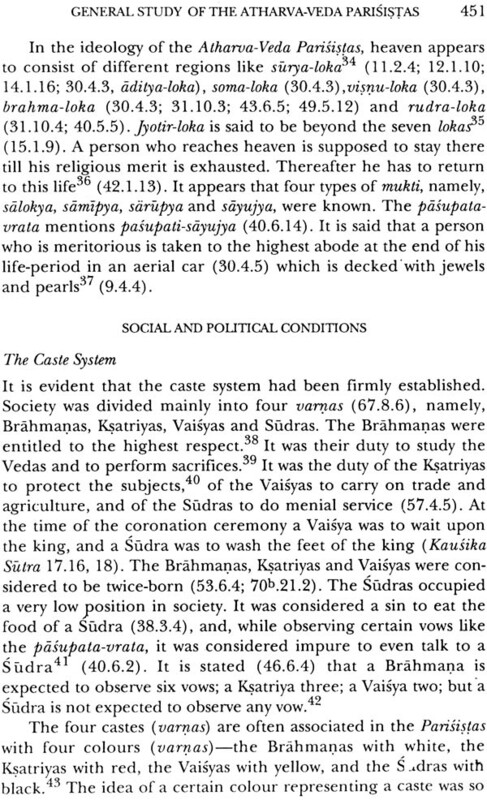 The kaushika sutra was first edited by Bloomfield. In his long and critical introduction Bloomfield discusses ht nature of the Kausika Sutra, its commentators, its Atharvanic character and its relation to the Vaitana Sutra and other literatures. 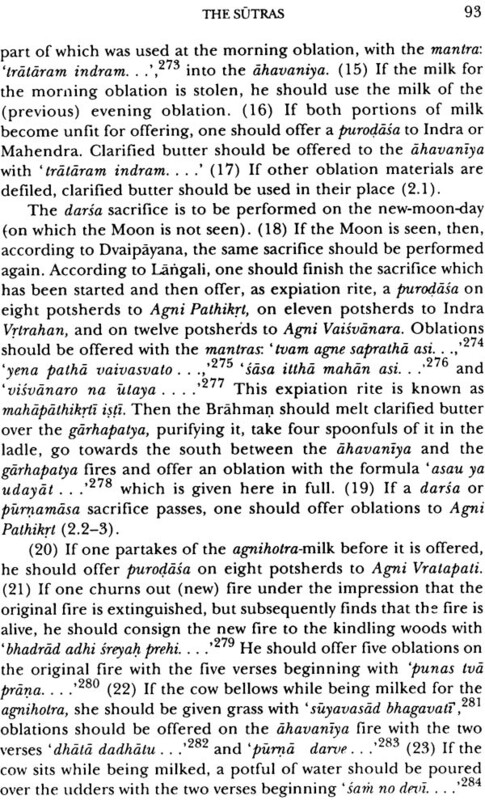 Extracts from the Padhali of kesava are given at the end of the text and extracts from ht commentary of DArlila are given in the footnotes to the texts. A number of useful indices are also appended. Another edition of the Kaushika sutra by Uday Narayan a simha was published at Madhurpur (Bihar)_ in 1942. It consists of an introduction about the contents of the kausika sutra, the text with Hindi translation and extracts from the Paddhati of Kesava. 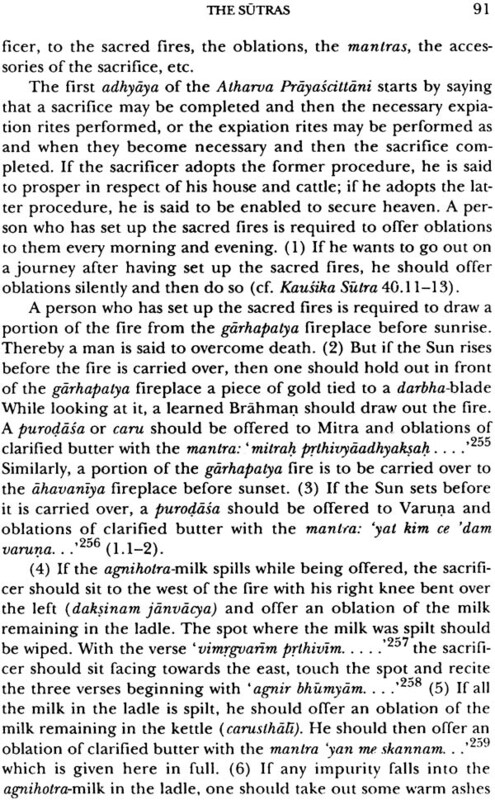 The Vaitana Sutra has been edited by Richard Garbe. His edition contains a short preface, the text, text-critical notes, and index of quotations, index of words, and introduction and translation in German. Another German translation of the Vaitana sutra by W. Caland was published at Amsterdam in 1910.